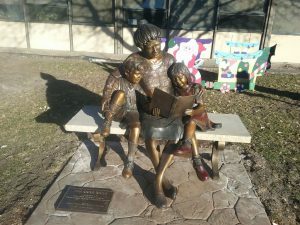 Our new memorial, the bronze sculpture “A Good Book” by Mark Lundeen, will be dedicated with a brief ceremony on Friday, December 21 at 2 pm. We’re hoping for good weather, but even if it’s bad, we’ll be having cookies and coffee in the library immediately after. It’s a truly marvelous piece of art, and we’re extremely grateful that we were chosen to host this. Kudos to the Citizens for Bronze Statuary and all who worked to make this project come to fruition! Come join us next Friday at 2 to celebrate the new art and joy of reading!